It's not a B3, not even a B4...in fact it's a B8! 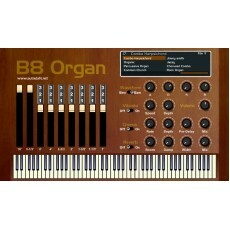 B8 Organ is a VST (Windows Only) reproduction of the old organs of the 60's-70's. It has 9 oscillators, switchable between sine and saw wave, with drawbars, vibrato, chorus and reverb. Sine waves results in tones typical of a church organ, or hammond-type sounds. Saw waves sound more like old combo organs, like Farfisas, Davoli, Crumar. If you find my FREE stuff useful, can I ask you for a small donation in exchange?